The Twisted Kit EZX offers users the chance to explore the unconventional with it's unique replacement percussion engine. This Twisted EZX was developed in collaboration with Michael Blair and Sontronics Microphones. In October of 1985 Tom Waits released the album Rain Dogs. The album was an instant classic and marked a new sound for him. A rough, dirty neo-blues style with awkward rhythms and hard edges. Part of the band that contributed to that sound was drummer and percussionist Michael Blair. His highly personal instrument set-up which included a mix of regular drums and odd bits and pieces like trashcans, bedroom furniture and rusty bicycle frames fit perfectly with the sound that Waits was looking for. The combination of Michael's timing, expression, and junkyard sounds created a rich and useful range of musical textures to accent Waits' intricate storytelling. Michael Blair also played and toured with Waits on Franks Wild Years, the follow up to Rain Dogs, and later became an integral part of the recordings for Elvis Costello's Spike (1989) and Lou Reed's Magic and Loss (1992). Spike became Costello s most commercially successful and sonically adventurous album to date. Michael also has added his trash-can consciousness to records by the respected producer Hal Willner, in "tribute" albums celebrating the work of composer Kurt Weill, poet Allen Ginsberg, Walt Disney, Charles Mingus and in collaboration with avant-theatre director Robert Wilson. Drummer Michael Blair is an almost invisible presence, combining lithe percussive flourishes with the heartbeat simplicity of Maureen Tucker's timekeeping with the Velvets. So, two rototom frames form a tonal hi-hat, a duck call suggests an alternative cowbell, tack drums from China become rack toms and putting the hubcap of your very first car on top of your snare seems like the right thing to do. Michael Blair crosses over boundaries of industrial, blues, ethnic, orchestral, and replacement percussion to form a unique sound. 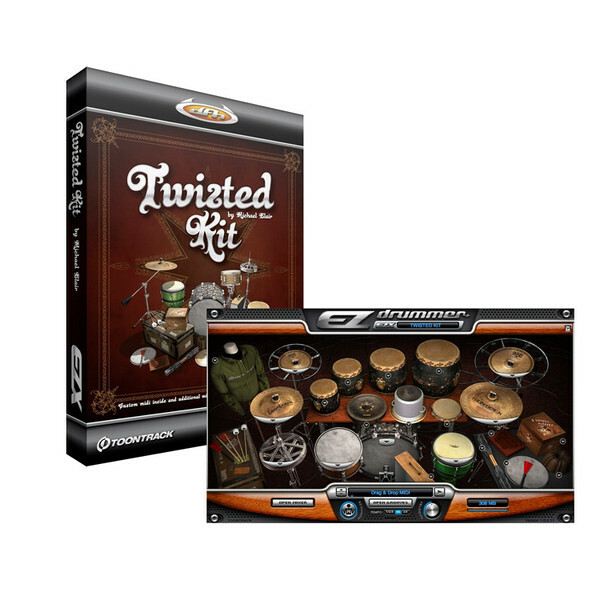 The Twisted Kit EZX® brings you that sound both in the recordings and the MIDI recorded by Michael. The Twisted Kit EZX® by Michael Blair was sampled through the very best of outboard with distortion, reverb, compression and attack effects included in the internal mixer. This enables you to access a large number of mixer presets by STS 9, Richard Devine, DJ Amplive, sub-ID and Count Bass D. And you can save your own custom mixer presets (with EZdrummer® 1.1 or higher).